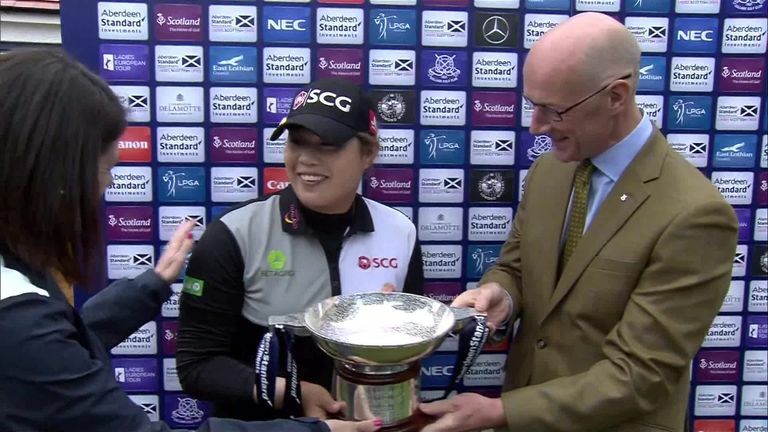 Thailand's Ariya Jutanugarn produced a superb up-and-down at the final hole to claim a one-shot victory in the Aberdeen Standard Investments Ladies Scottish Open at Gullane. The 22-year-old's drive found the rough at the 18th and she then sent her second shot wide to the right of the green. However, she chipped her third shot to within 18 inches and tapped in for par to secure the title, but only after her playing partner Minjee Lee had missed a four-foot birdie putt to force a play-off. Jutanugarn, who had started the day in a tie for the lead with Amy Yang, closed with a five-under 66 to finish on 13-under 271 and one ahead of Australian Lee, who matched her 66. The victory also took Jutanugarn, who won the US Women's Open last month, back to world No 1 ahead of the Ricoh Women's British Open which starts at Royal Lytham & St Annes on Thursday, live on Sky Sports Golf. Jutanugarn birdied the second but found herself trailing both Lee and South Korean Yang when she made her only bogey of the day at the sixth. But three successive birdies from the seventh took Jutanugarn back to the top of the leaderboard and she remained there thanks to birdies at the 11th - where her ball hit a rake to prevent it from going in a fairway pot bunker - and 16th despite a determined challenge from Lee who birdied the 10th, 11th and 16th. "It means a lot to me. I said this week to my caddie I want to win once on a links course and I did it and it is a dream come true," Jutanugarn told LPGA.com. Yang, in contrast, bogeyed the 13th, 16th and 17th as she carded a one-over 72 to drop into a tie for fifth place with Spain's Carlota Ciganda on seven under. South Korean duo Jin Young Ko (67) and Haeji Kang (69) shared third place on eight under. Bronte Law (688) was the leading British player in a tie for 17th on three under, one ahead of Mel Reid (70) and Georgia Hall (72), while Charley Hull (72) finished a shot further back.